Women in the Arts and Media Coalition: WomenArts: Get Ready for SWAN Day 10: Post Your Events or Write for Us! WomenArts: Get Ready for SWAN Day 10: Post Your Events or Write for Us! Celebrate SWAN Day by posting events on the SWAN Calendar, writing for the WomenArts Blog, or making a gift to WomenArts. It is hard to believe, but March 25, 2017 will be the 10th Anniversary of Support Women Artists Now Day/SWAN Day! The international holiday we declared back in 2008 has now been celebrated with over 1,500 events across the U.S. and in 35 other countries. 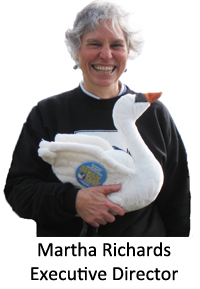 We have big plans for SWAN Day 10, and we hope you will join us by posting your events on the SWAN Calendar, writing for our blog, or making a gift. Post Your Events on the SWAN Calendar! We invite you to create events celebrating women artists and post them on our SWAN Calendar. If you want us to write about your event in a blog post or newsletter, posting it on the SWAN Calendar is the best way to send us the information. Please feel free to post events in any art form - just be sure that they feature women artists in key creative roles. You can add events by filling in our online form or by sending us a link to your Facebook event page. If you need help, check out our Step-By-Step Guide to Posting Your SWAN Event. NEW! Write for the WomenArts Blog! Inspiring Women – Articles about extraordinary/inspiring women artists, women artists overcoming obstacles, or festivals of women artists. Gender Parity Research & Actions – Articles summarizing research studies, legal actions, demonstrations or other activities related to the struggle for gender parity in any art form. Helpful Resources – Articles with tips for women artists on publicity, fundraising, crowd-sourcing, job-hunting or other business aspects of their work; articles about helpful directories, websites or other resources. For more information, please see our Blog Submission Guidelines. You can submit your ideas with our Blog Inquiry Form. In these challenging times, it is more important than ever to make sure that the voices of women artists are heard! Help us make SWAN Day 10 the best SWAN Day ever! Make a gift to WomenArts today! Looking for Theatre or Film/Video Grants & Other Opportunities?